I have a ton of pictures from our day yesterday, but don't have the patience to go through them tonight. So, lets skip to today. 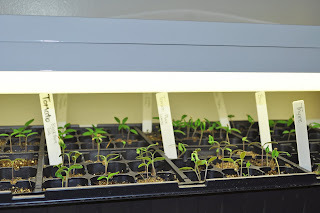 Here are pictures of my seedlings. The kale I showed you last time has gotten very full, I actually thinned it yesterday. And, just about everything else in the tray has sprouted. Camdyn helped me put the seeds in, and I think we must have missed a few. I re-seeded about 6 spots today. You can see my onions in the front, and the peppers between the onions and kale. Past the kale are black eye susans and some pretty blue and purple flowers, but I can't remember their names. I made the mistake of planting these in potting soil instead of regular starting soil, maybe that's why some didn't sprout? Here's my tomato tray! It's full of tomatoes, except the front corner that has 6 basil starts and 3 thymes. I tried to take a picture of my light so I could show you my set-up. I use $10 shop lights from the hardware store. They came with chains, so Troy just screwed hooks into my shelf and hung them with the chains. 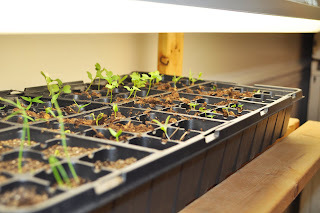 That way, I can adjust them as the seedlings grow taller. I have some nice heirloom tomatoes in here, some I've grown before, some that are new to me. 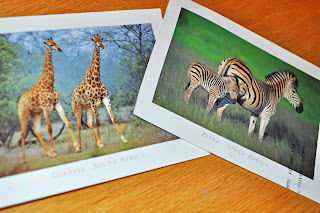 Camdyn and Averie got postcards from their grandparents in South Africa today! Camdyn had gone to the mailbox with Troy, which she doesn't usually do. It was neat that she was right there to get it out of the mail instead of us just handing it to her. I'm not sure Averie's read hers yet, we'll read it to her at breakfast tomorrow. You have quite the garden! I love tomatoes. One year I'll try to grow my own.